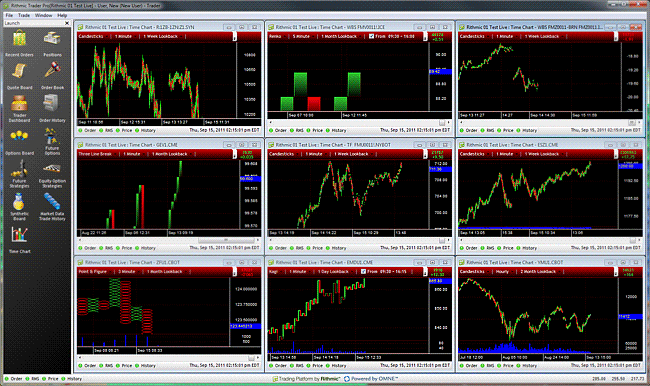 R | Trader Pro™ is R | Trader™ with charts and a real-time interface to and from Microsoft Office Excel. In addition to all the functionality of R | Trader™, with R | Trader Pro™ you can view about 100 studies and stream them in real-time into Microsoft Office Excel spreadsheets. With the power of Excel, you may develop your own indicators and, using Rithmic’s two way real-time interface, you may configure trades to be sent back into R | Trade Execution Platform™ through R | Trader Pro™, automatically or with the click of a button.